Mounting Packages available for most air seeder models. 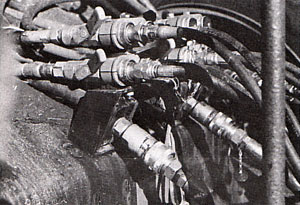 Large Hydraulic lines prevent heating. Anti-intensifier valve – allows fan to free wheel when motor is shut off. Save cost of PTO on tractor. More air available on corners when engine RPM is cut back. Noticeable fuel saving because of being able to operate at maximum efficiency. Seed hoses do not plug. 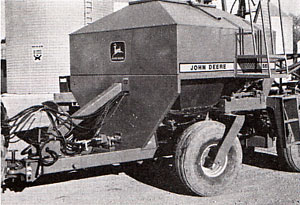 Air seeder with Hydratec hydraulics drive in place on tongue of 665 air seeder. Note drain line and customer fabricated resiliant mount. 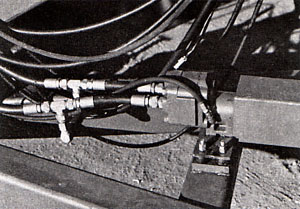 Note unique Stauff clamps supplied in kit to hold maximum flow quick couplers & dust caps. 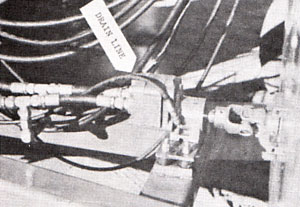 Close-up of finished installation to duplicate 1,000 RPM input speed fan. Not everybody’s tractor will do it. Each tractor must be tested for flow and pressure quality to qualify for this application. Package includes an extreme service motor to run at 1000 RPM and has hose assemblies related motor valving and adapters to run air seeder drive. Mechanical mounting and drive shaft adapters are the responsibility of the customer; but some mounting packages are available from Hydratec.